As those that have been to this site a lot have noticed, I have a weakness for hot dogs. Indeed, a coworker claiming that “hot dogs are just hot dogs” was one of my inspirations for starting this blog, since there are really quite a few varieties of hot dogs in existence (indeed, I’ve got as far as the Iceland Pylsur in my reviews). One of the more intriguing things I like is when essentially the same concept, like the “Chili dog”, gets some regional variations. When I was growing up (in the Southwest), a chili dog was simply a “chili dog” (albeit with the caveat that the sort of chili that makes a good condiment isn’t the same sort that tastes good in a bowl). 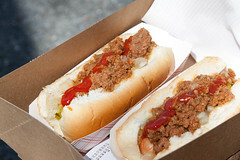 The “Coney Island” dog is a variant of this with “Coney sauce”, a meaty, near-chili spicy meat sauce, and can be spotted by that name ranging from Michigan all the way over to Massachusetts. However, nearly the exact same dog as a “Coney Dog”, with a slightly drier and less spicy sauce, goes by the name “Texas Hot” or a “Michigan” (likely in homage to the Coney Island variety primarily coming from Michigan) in Upstate New York and Vermont (and as far north as northern Quebec, my friend Ben has a great story about buying a “Michigan” hot dog at a food cart in Radisson, Quebec in far, far, northern Quebec). 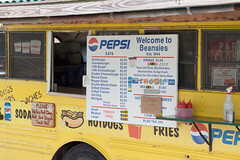 And a particularly good example of the “Michigan” hot dog can be found at Beansie’s Bus in Burlington, VT. 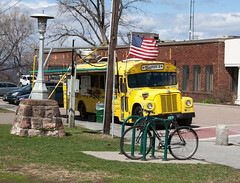 Parked in a more-or-less permanent spot on the North side of Burlington’s Battery Park, Beansie’s Bus is a fairly common sighting from April to around November, selling hot dogs, burgers, fries, and the ever-important creemee (for non-Vermonters: regional name for soft serve) out of a converted school bus (and from what I’ve heard, the current Beansie’s Bus is actually just the current bus in a lineage going back all the way to 1944!). 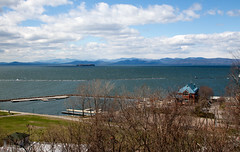 It’s really a nice arrangment: Battery Park is a fairly pleasant park and playground, and it has a rather pleasant view down the bluffs to Lake Champlain, the Burlington waterfront, and the distant Adirondack mountains. It’s also obviously a local tradition, since I usually see this place with 20 people in line on a Saturday afternoon. In any case, we were here for the Michigans, and that’s what we got. Since we were between meals (sadly, the life of a food blogger often involves careful pacing! ), that was the entirety of our order. But a minute later, we had our pair of Michigans and wandered over to the bluffs to sit on a bench and enjoy the hot dogs while soaking up the scenery (and the pleasant unusually warm 76 degree weather). So, how was the dog? Beansie’s Michigan starts with a good quality dog, in this case a McKenzie of Vermont hot dog. Those are one of my favorites for widely-available hot dogs. While some might scoff at their being a primarily-pork hot dog, I’ve always liked McKenzie dogs, having natural casings (the snap is important), good smokiness, and more than a little spice. The next major ingredient was the Michigan sauce, and like most other “Michigans” I’ve had, this was a sauce that focused on the meat and not spice, with a rich beefy flavor and nice spicing without getting greasy. Add in some ketchup, mustard, and onions, and this was a rather enjoyable hot dog. I liked Beansie’s. They put together their hot dogs with care, have a nice location by the park, and they’ve got reasonable prices and friendly service. I’d like to come back here again with more stomach space and try other their fries. And maybe a creemee. Hi Kaszeta, great to see you back! Always jealous reading of good hot dog spots. I guess our snacking equivalent here are street tacos. Beansie’s is always a sign of warmer weather…I’m so looking forward to visiting soon!